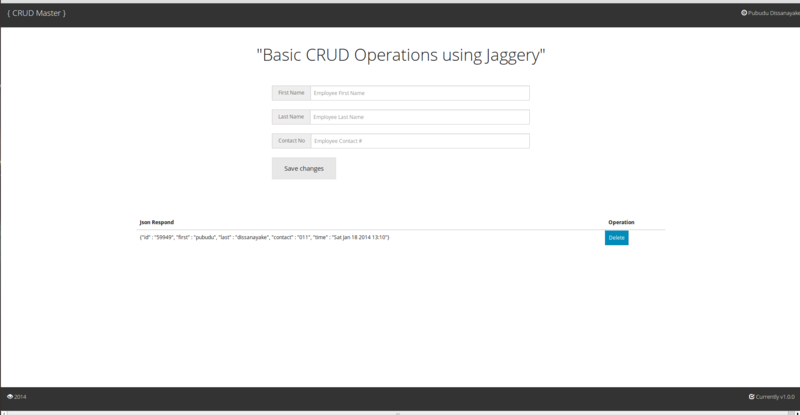 In this series of Jaggery.js tutorials, I’m going to talk about how to perform basic CRUD operations using Jaggery.js. If you want to know what and how Jaggery.js works, please refer my previous post for further clarifications. I hope you have downloaded all the necessary tools which are mentioned above. follow the instruction as it is. Create a Jaggery configuration file called jaggery.conf which specifies the application specific configurations.for this example it contains application URL mappings. application context as follows. Now we are going to create our first jaggery file. In-order to isolate the server-side logic create serverReq.jag jaggery file inside modules directory. Basic CRUD operations as follows. var dataSource = new Database("
Published at DZone with permission of Pubudu Dissanayake . See the original article here.